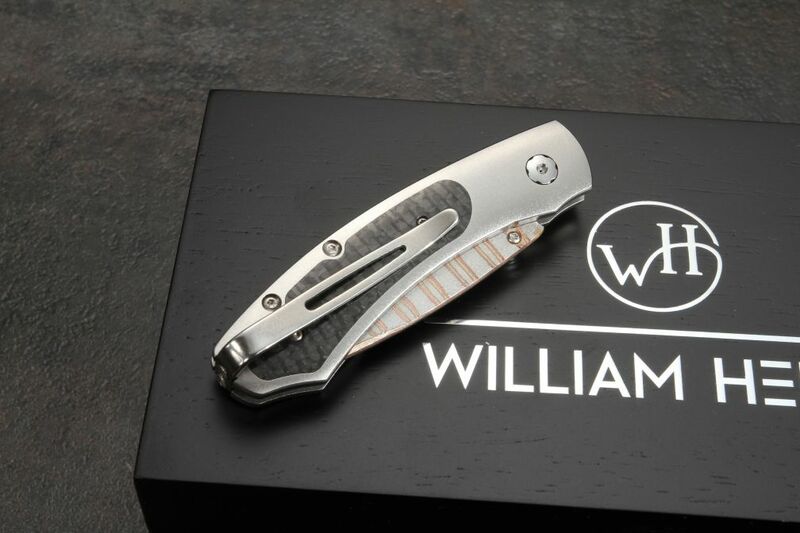 The William Henry B09 Fervor, or Kestrel knife is an aerospace grade titanium framed tour de force. The Fervor is a limited edition knife, perfect for upscale carry that offers some of the best materials available to knifemaking. 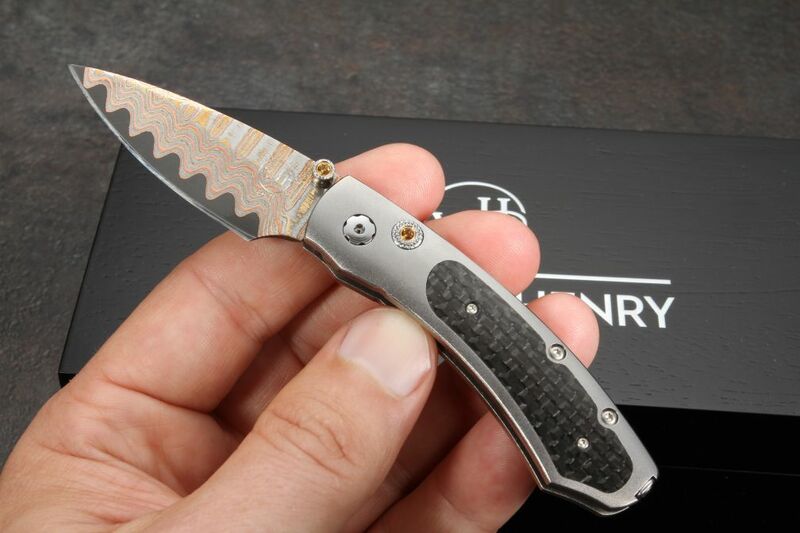 With a carbon fiber inlay, the aesthetic holds its own among other tactical blades, however, the 45 layer copper wave Damascus steel blade puts it in a category of a museum-quality showpiece. Not bad for an everyday carry knife! Measuring 2.13" the knife is easily deployed and closed with a citrine inlaid gemstone thumbstud and lock. The 2.88" handle and titanium clip allow for secure and lightweight point up carry, until you need to extend the knife to its 5.88" overall length. 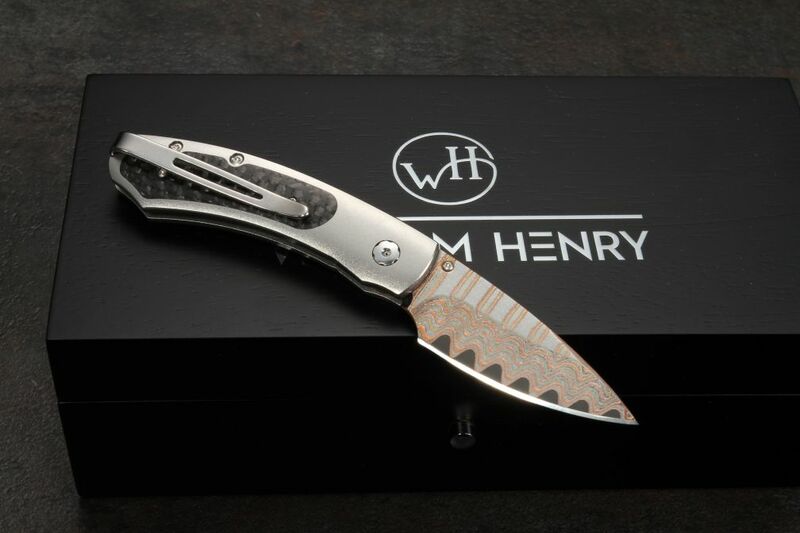 Which you are going to find yourself doing a lot, just to admire the William Henry quality craftsmanship. 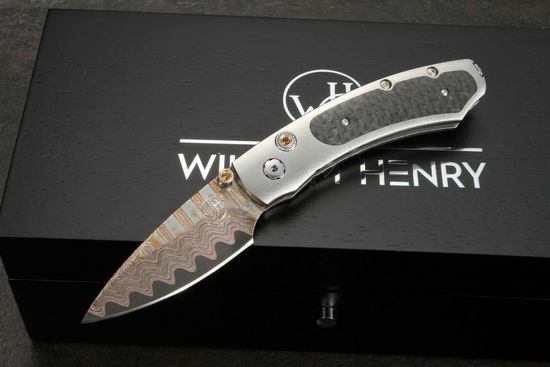 The VG-5 stainless steel core gives the knife a Rockwell hardness of 59, even with the copper layers, which provide not only a striking image, but strength, flexibility, and durability that allow this blade to cut with confidence and still hold that razor sharp edge in spite of whatever punishment you throw at it. For tactical, recreation, and everyday carry, the B09 Kestrel Fervor will be as at home in the front pocket of your slacks as it is clipped to your belt on the trail. It sacrifices nothing in function for what it reveals in beauty. William Henry blades are world renowned for the dedication to craftsmanship, beauty, and utilitarian design, and this blade is no exception. It's almost unfair to just call them knives, and even more unfair to call them jewelry. 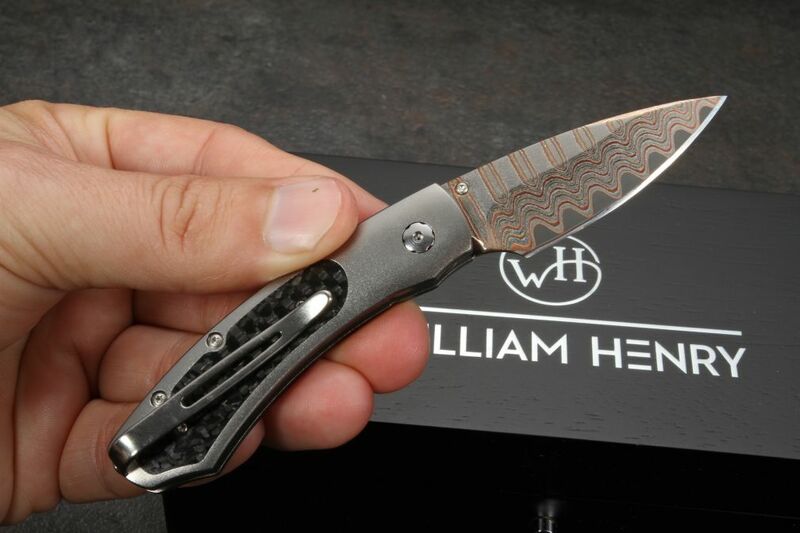 William Henry stands behind their product and is so confident you are going to be satisfied with your blade that as an authorized dealer, Knifeart.com provides no restocking fees, professionally curated merchandise, and fast free shipping on US orders over $150.